The Nagler Helicogyro is entirely new to this country, and Flight is pleased to be first with a picture of this machine. 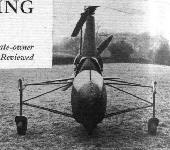 ДальшеMore>>> It has a single two-bladed rotor, and can be flown either as a helicopter or as an Autogiro. The torque reaction from the rotor is overcome in a very ingenious way, and the machine has made hovering flights of ten minutes' duration over a field a few miles from London. An interesting feature of the design is that the engine drives a "pusher" airscrew, the pilot having a perfect view from the cockpit. More than that it is not permissible to say at the moment.